A brand new sushi restaurant called Point Sushi Bullet Train Sushi Bar opened up in Calgary just a few weeks ago, where the old Sakana Grill was located. This completely renovated space was revamped from its predecessor with new seating arrangements and built-in tracks to accommodate a high-speed bullet train sushi system. 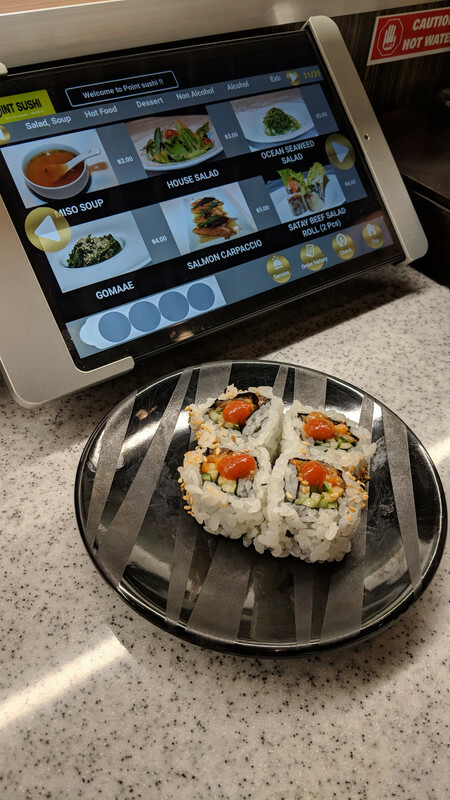 The concept is pretty simple, order straight from their menu on an iPad screen, ordering only four items at a time (to fill the available spots on the bullet train), then send your order up to the kitchen using the “Order” button. Moments later, your food will dash to you on the bullet train and stop at your table. The iPad will then notify you on the screen that your specific item has arrived, and you’ll get a sound notification too. Once you remove your plate(s) from the train, the bullet train then dashes back into the kitchen, waiting for its next shipment. I noticed that although we ordered four items at a time, the train had four slots on it, but only a few of those would actually be filled when the items were delivered to our table. However, that’s not too much of a downside, as you can pretty much order again, straight after sending your four items up to the kitchen. At the time I was there, there were only 29 menu items available. 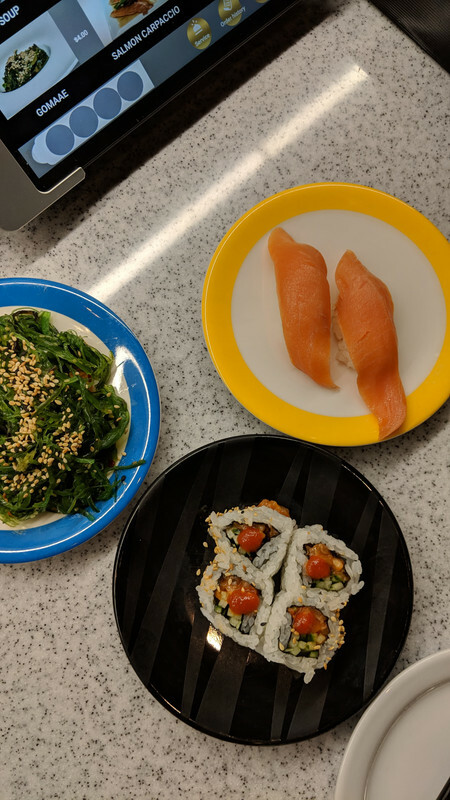 I’m pretty selective when I eat sushi (pricing and if they have a variety), so I only got a few sushi items plus some non-sushi items to try. The Spicy Salmon Roll was the first roll I ordered to trial the sushi quality/rice. The place had only opened a few weeks ago but I had a few people mention to me that the sushi wasn’t great, so I proceeded with caution. I had to say, the sushi was good! Not a lot of salmon was inside the roll, however, this roll was only $2.00, so it was a pretty great deal. Usually, a roll like this would cost around $3 – $5 at other places. I was itching to order some more of this because it was yummy and cost-effective, but of course, I had to try their other items to review more of them. Heh-heh! I then ordered the Salmon (Sake) Nigiri. It tasted good and the fish tasted fresh. However, the fish did fall apart from the rice very easily. I would still order it again though! The price for this small dish was $3.00. I decided to take a break from eating rice/sushi and ordered one of my favourite salad dishes… Seaweed Salad. I was super surprised when it was brought out on the bullet train, “this mountain of seaweed was sitting in front of me, and only for $3.00?” is what I thought. Underneath this mountain was some shredded carrots. It didn’t taste that great. It was missing the strong sesame/vinegar taste that I really like about seaweed salad. It wasn’t my favourite dish. Hot food! I was craving something fried and delicious…. and this Takoyaki dish satisfied that craving immediately. I think this was $5.00. It was piping hot like takoyaki should be, and had the right amount of batter with octopus inside. Each portion was pretty small, but it was super tasty! Lastly, I glanced over at another table while trying to catch a video of the bullet train coming down our way… it stopped at the table before us, as they had ordered two plates that looked like they had a heaping amount of sashimi. So… I had to get one! At $6.00, I was really worried about how much sashimi that would get me. It wasn’t too bad for the price, as I got three big cuts of salmon sashimi. They were pretty good! Now I usually don’t boast about bathrooms… but, they have some cool bidet toilets in the washroom. The bidet has options to wash you after you do your business, and you can control this right from the remote control that’s mounted on the side of the stall. Pretty cool if you ask me. Felt like I was in Japan again! No photo available, because that would’ve been weird to take one… Sorry! After we were done eating, we had to bring up a piece of paper that had a barcode on it, up to the counter to pay. Splitting the bill was super easy, as we just had to tell the cashier how much each of us wanted to pay on the bill. They also had a huge bowl of fruit candies, great for those with a sweet tooth.